Heartbreaking photos of a neglected baby orangutan kept as a pet in Indonesia don’t depict an isolated incident of animal mistreatment, but reflect the horrific toll of the palm oil industry, according to an international animal rescue group. The young orangutan, later named "Gito" by rescue workers, was previously kept as a pet by Pak Ajung, the head of a village in Ketapang’s Simpang Hulu district on the island of Borneo, Lis Key, spokeswoman for UK-based nonprofit International Animal Rescue, told The Huffington Post. A local group, the Centure for Orangutan Protection, contacted IAR a few weeks ago with concern over the animal’s welfare. Gito was suffering from a severe case of mange when rescue workers found him. In addition to the skin condition — which turned out to be a serious case of mange — the orangutan was also suffering from severe dehydration, malnutrition and diarrhea caused by a lack of proper care. “Gito was being kept in an instant noodle cardboard box, wet from his own urine, and given only sweetened condensed milk from a can,” Key said. While a press release described Gito as having been "left out in a backyard in the sun to die". Key said Ajung appeared to be more overwhelmed than intentionally cruel. “The man was keeping him as a pet but when he became sick … he dumped him in the box. … I suspect that he simply found the problem of having a sick baby orangutan on his hands too difficult to deal with,” she explained. Ajung, she said, was happy to turn the animal over. Gito now resides at the IAR’s orangutan rehabilitation centre in Ketapang, West Borneo. He’ll stay in the organization’s care for several years, socializing with other orangutans and learning skills he’ll need to survive in the wild. If he’s successful, Key said, he’ll ultimately be released into a protected forest. Gito, a three to four month old orangutan was found severely malnourished in a cardboard box in Hamlet Giet, Merawa Village, in Simpang Hulu District of Borneo. 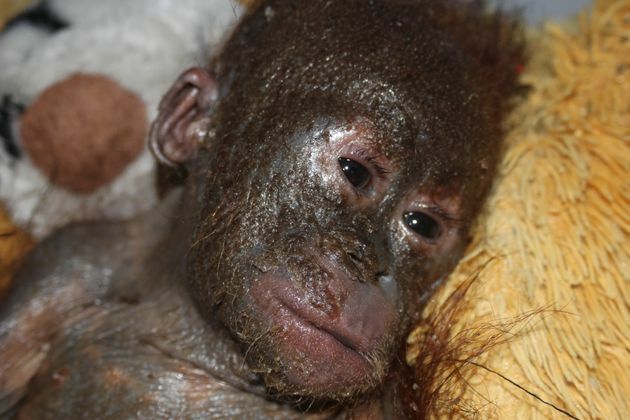 Gito is now being rehabilitated by IAR at their office, which is approximately 170km away in West Borneo. Keeping orangutans as pets is illegal in Indonesia, and hard stats about the black market trade are hard to come by, but the practice is “widespread” in many parts of the country, according to non profit group Orang Utan Republik Education Initiative. Wealthy families often keep pet orangutans as status symbols, Richard Zimmerman, executive director of Orangutan Outreach, told Scientific American earlier this year. The illegal pet trade is fueled by rampant habitat destruction -- primarily caused by the palm oil industry -- on the islands of Borneo and Sumatra. The two Indonesian islands are the only places left where the endangered creatures still live in the wild. Sometimes, people will capture the babies "opportunistically" when they happen to have killed a mother -- as opposed to intentionally seeking out a baby with the mother -- and either keep the baby or sell it for profit. But others will intentionally target mothers in order to sell the young on the black market, according to the Sumatran Orangutan Conservation Programme. The babies are typically ripped away from the bodies of their dead mothers, and the stress of capture, transportation and subsequent captivity is so great that most infants don't survive long. Even if they do, the end result is inevitably tragic. Some owners don't know how to care for the animals, as evidenced by Gito and another orangutan, Budi, that the IAR rescued earlier this year. And if the apes make it to adulthood, keeping the large, strong animals around the home becomes dangerous, and owners end up having to keep them inhumanely confined to cages. But Key believes the deforestation and the practices of the palm oil industry, not individuals like Pak Ajung, are truly to blame for the plight of orangutans kept as pets.